The list of cardinal-electors as of today is 118. 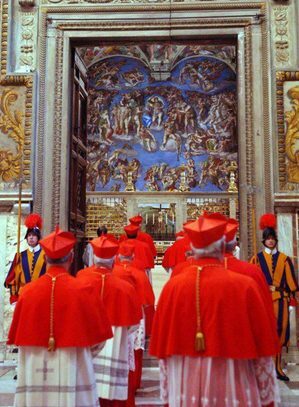 According to the Law of the Church, at the time that the Chair of Peter becomes vacant, those cardinals who achieve 80 years may not vote in the conclave. Pope Benedict said today that the Church is sede vacante at 8pm (Rome time) on 28 February. Therefore, Lubomyr Cardinal Husar born on 26 February 1933 becomes unable to vote in the 2013 conclave. But observers will note that there are three cardinals who will be 80 around the time of the next conclave, a date still to be announced by Tarcisio Cardinal Bertone, Cardinal Secretary of State and the Carmerlengo. In 2005, there were 117 cardinals (but only 115 participated in the papal election). The oldest cardinal walking into the conclave will be Godfried Cardinal Daneels (4 June 1933), the emeritus archbishop of Mechelen-Brussel, Belgium. The youngest cardinal will be Baselios Cleemis Cardinal Thottunkal (15 June 1959), Major Archbishop of Trivandrum, India.